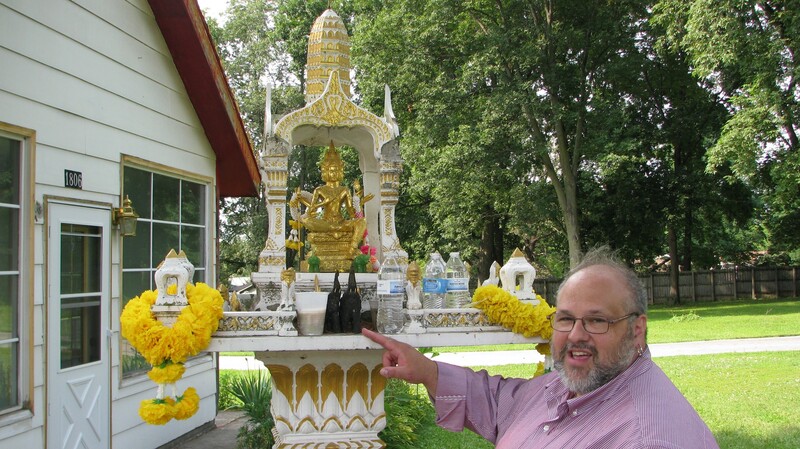 Dr. Christopher W. Chase discusses votive offerings left at a small shrine at Wat Lao Buddhavas, a Laotian Buddhist temple in Des Moines, IA. Dr. Rose Caraway in Cuba’s second largest city, Santiago de Cuba, washing her hands using a recycled water bottle as part of her research on permaculture ethics. 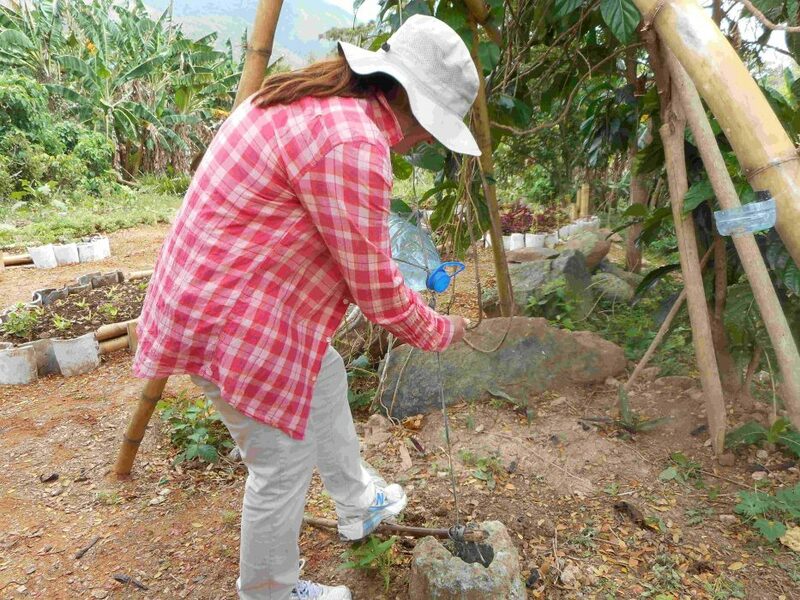 Dr. Rose Caraway in Cuba’s second largest city, Santiago de Cuba, washing her hands using a recycled water bottle as part of her research on permaculture ethics. An important rule in permaculture ethics: don’t throw things away. And, as Obama put it during his visit to Havana, “Cubans invent from the air.” Dr. Caraway teaches Introduction to World Religions and Religions in the Caribbean and Latin America. 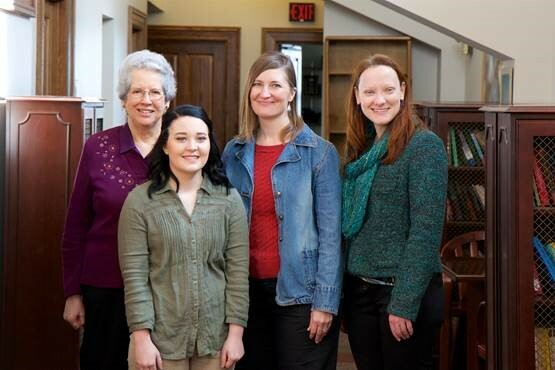 2016 Dorothy Scholarship recipient Natalie Young, with Professors Clifford, Padgett-Walsh, and Caraway. 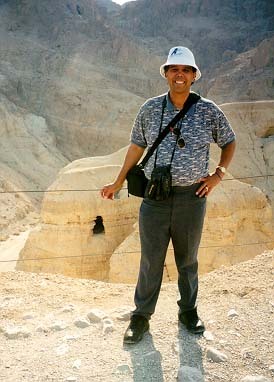 Dr. Hector Avalos at Qumran, Israel, the site near where some of the Dead Sea Scrolls were found. Dr. Hector Avalos at Qumran, Israel, the site near where some of the Dead Sea Scrolls were found. Dr. Avalos teaches all our Bible courses, which place the Bible in the context of ancient civilizations of the Near East. How the biblical texts have been interpreted and adapted throughout history is another focus. His other research areas include health care in the ancient world, science and religion, U.S. Latino Literature, and religion and violence. From Dr. Travis Chilcott’s research on Hindu devotional traditions, which involves photo-documenting devotional ecstasy in rural India. 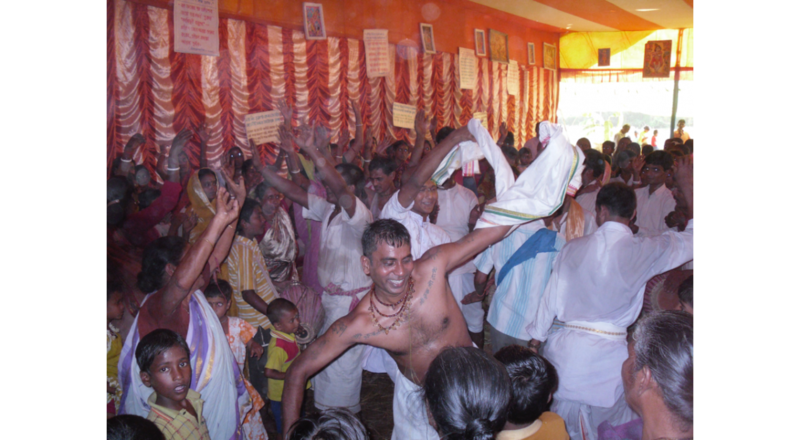 This picture comes from Dr. Travis Chilcott’s research on Hindu devotional traditions, which involves photo-documenting devotional ecstasy in rural India. Dr. Chilcott teaches Religious Traditions of India, Introduction to World Religions and Theory and Method in the Study of Religion. 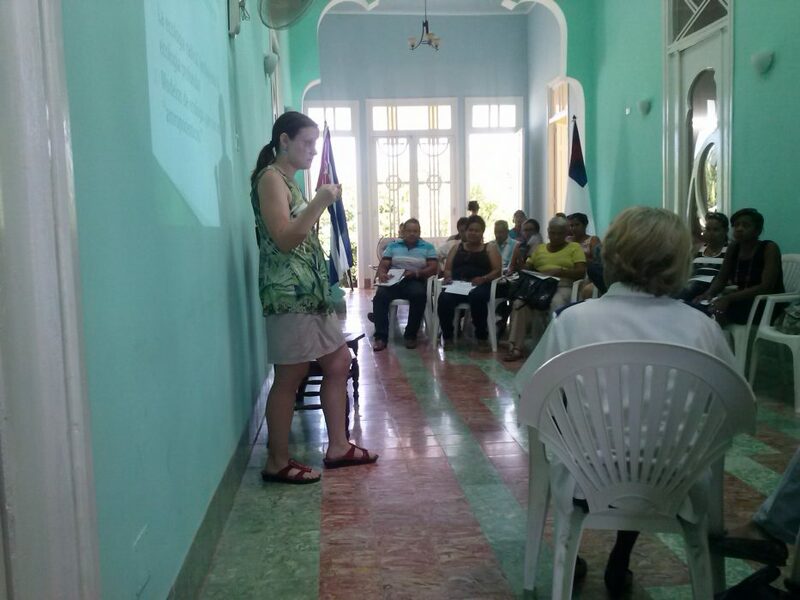 Dr. Rose Caraway delivering a presentation on deep ecology (an ecological and environmental philosophy advocating the inherent worth of all living beings) at the Centro Cristiano Lavastida in Santiago de Cuba. Dr. Rose Caraway delivering a presentation on deep ecology (an ecological and environmental philosophy advocating the inherent worth of all living beings) at the Centro Cristiano Lavastida, in Santiago de Cuba. 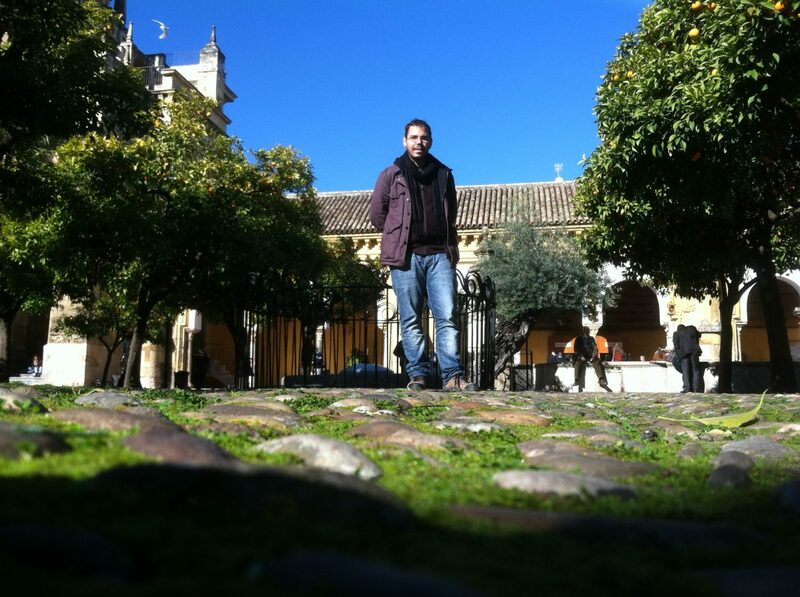 Dr. George Archer taking a walk on the pagan Roman foundations of the Islamic mosque courtyard of the Catholic Catedral de Santa María de la Sede. 2Dr. Rose Caraway in Cuba’s second largest city, Santiago de Cuba, washing her hands using a recycled water bottle as part of her research on permaculture ethics. An important rule in permaculture ethics: don’t throw things away. And, as Obama put it during his visit to Havana, “Cubans invent from the air.” Dr. Caraway teaches Introduction to World Religions and Religions in the Caribbean and Latin America. 4Dr. Hector Avalos at Qumran, Israel, the site near where some of the Dead Sea Scrolls were found. Dr. Avalos teaches all our Bible courses, which place the Bible in the context of ancient civilizations of the Near East. How the biblical texts have been interpreted and adapted throughout history is another focus. His other research areas include health care in the ancient world, science and religion, U.S. Latino Literature, and religion and violence. 5This picture comes from Dr. Travis Chilcott’s research on Hindu devotional traditions, which involves photo-documenting devotional ecstasy in rural India. Dr. Chilcott teaches Religious Traditions of India, Introduction to World Religions and Theory and Method in the Study of Religion. 6Dr. Rose Caraway delivering a presentation on deep ecology (an ecological and environmental philosophy advocating the inherent worth of all living beings) at the Centro Cristiano Lavastida, in Santiago de Cuba. As Secretary of State John Kerry declared in 2013: “if I went back to college today, I think I would probably major in comparative religion because that’s how integrated [religion] is in everything that we are working on and deciding and thinking about in life today.” The evident power of religion in today’s world makes it imperative that we, as global citizens, study it. It will also help you prepare for a number of careers. What skills will I gain with a Religious Studies degree? Studying religion will give you valuable skills in cross cultural understanding, empathy and tolerance that is grounded in critical, informed analysis, independent research skills, interdisciplinary thinking, social research methods, and written and verbal communication skills. In many professional fields, such skills are in high demand. What if I want to choose Religious Studies as a second major or minor? Religious Studies can easily be combined with other majors, enhancing and deepening your current plan of study. It can easily be combined with political science, anthropology, or journalism, for example, or add a liberal arts component to your degree program in Food Science, Veterinary Medicine, Engineering, Environmental Studies, Kenesiology, or one of the many other degrees that ISU offers. You don’t have to be religious to major in religious studies. Like anthropologists or sociologists, religious studies scholars seek to understand dimensions of the human experience. Some are drawn to study religion because they want to better understand their own faith, while others are drawn simply because they want to better understand the powerful ways in which religions shape our world. The study of religion can lead in many directions, qualifying undergraduates for further study in graduate school and giving them a leg up in certain areas of the job market. As an academic major in the humanities, the study of religion is like a history or English major; it imposes no limitations. But it also lends its own particular strengths to a number of different career paths. Preparing for Law School: Religious Studies majors are well-positioned for law school. In this graph, you can see that religion majors feature a powerful combination of GPA scores and LSAT scores that place them among the top performers on the Law School Admissions Test (LSAT). Preparing for Medical School: To apply to medical school, you will have to take the Medical College Admissions Test (MCAT). The MCAT does not publish average scores by specific majors. But they do report that humanities majors (29.4)–which includes religious studies–score better than those majoring in biological sciences (28.1). In 2015, the MCAT will include a “Critical Analysis and Reasoning Skills” section that will require students to analyze, evaluate and apply information provided in passages from a wide range of social sciences and humanities disciplines, including religion and ethics. How is religion affecting our world today? Take a look. Commentary on hot topics at the intersection of religion, politics and culture. What kinds of things do scholars of religion study? Check out the annual conferences for the following scholarly associations to get an idea: AAR, ASR, IAHR, NAASR. Read the American Academy of Religion’s take on the growing relevance of religious studies. How a liberal arts education will help you be a better scientist. Without question, it was the Religious Studies program at Iowa State University that both equipped and inspired me to pursue scholarship in the field. As a unique discipline, Religious Studies engages the critical questions that are necessary to understand the influence of religion in global relations, domestic social issues, and the individual imagination. The education I received at ISU propelled me to ask such critical questions around issues of religion, ethics, and sexuality–and because of that, I am now a tenured professor, published, and still inspired to engage some of the most difficult issues of our time. I offer many thanks to the faculty of the Religious Studies program at ISU, and I recommend the program to all. Perhaps the most fundamental asset I have been afforded by studying religion academically is a deeper and more nuanced understanding of the world’s religions, an education which has in turn taught me how to better research and educate myself about expressions of religion all around me. As a religious studies major I have become a more knowledgeable student leader, a more engaged member of my religious communities, and I have also discovered the passion I want to devote my life to: helping other members of the LGBT+ (lesbian, gay, bisexual, transgender, etc.) community navigate the religious landscape around us. No matter what I do after my time at Iowa State, I know that I have chosen to study something that impacts every one of us on some level or another. Knowing I was going on to get my Masters from a private Christian institution, majoring in Religious Studies at Iowa State exposed me to a variety of classes, beliefs, students, and understandings of what religion means to a religiously-diverse world, better preparing me for a future of interfaith dialogue and relationships.